Logan LaPlante is a competitive freeskier from Lake Tahoe who enjoys mountain biking, skating, climbing, stand-up paddle boarding, fly fishing, public speaking, video, and design. He interns at Big Truck Brand and Moment skis. My name is Logan. 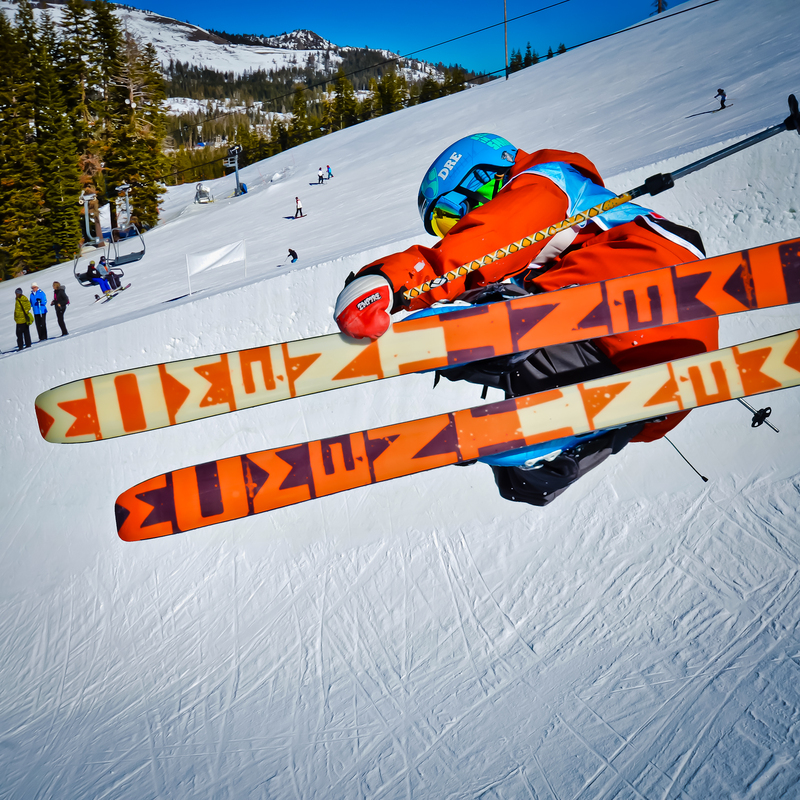 I’m 14 and I’m a competitive skier from Lake Tahoe, Calif. I’m taking a different route on my education. I don’t use one particular curriculum and I don’t use any one particular approach. I think of it as a remix or a mashup of learning, and I call it “hackschooling.” What I love most about hackschooling is the time I spend leaning hands-on skills at my internships. 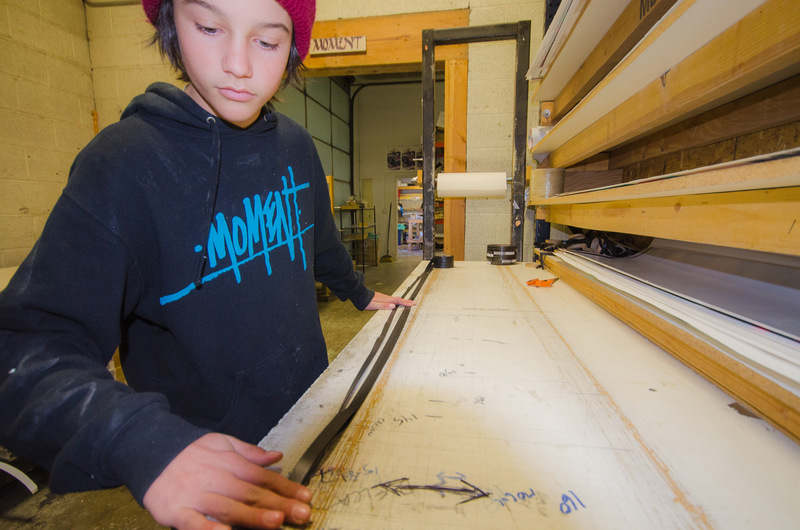 I intern at Moment Skis and bigtruck brand, and those days of the week are the ones I look forward to the most. My internships are my favorite part of my education because I learn so much every time I intern. The people I learn from are always stoked and love what they do. I want other kids to realize that they need to take advantage of cool opportunities like this while they’re young. People who have heard my TEDx talk titled “Hackschooling Makes Me Happy” want to know what I actually do and how I learn. I use a lot of different resources around me (you can read about some in my column from MAKE Volume 38). Of course, internships are only a part of my education, but in this post I’m going to walk you through a day at Moment and bigtruck, and describe the people I work with and how my internships make me feel. 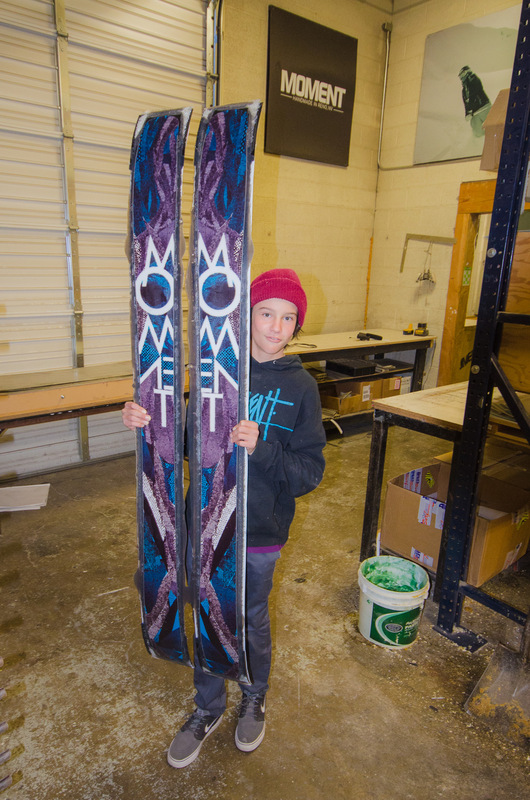 Moment Skis, located in Reno, Nev., is a unique ski business that makes only handmade skis. I’m learning how to make the skis that later, on the hill, myself and many other people get to ski on. Moment has always stood out because it’s the only company in the ski industry that uses square tips. Moment’s graphics also stand out because they’re always filled with so much. Sometimes the graphics are scary and cruel, while other times they’re very colorful and random. All-in-all they’re very creative! When I walk into the factory there’s a huge display of all of their skis and outerwear. On the left is the office, which is where I usually start off by stuffing letters with stickers and organizing files. Casey Hakansson, the founder of Moment, gives me a long list of things to do for the day. It’s not all glamorous, trust me, but how else am I going to learn to be disciplined? If you’re not disciplined and don’t pay attention, there are many ways to get hurt in the factory. Stuffing envelopes is not my favorite part of the job, but I need to do those things in order to be able to do all the cool stuff, like learning to make skis. In 2003, Casey made a pair of skis in his garage just because he could. Then another pair. Then his friends wanted a pair. Then they started paying him. 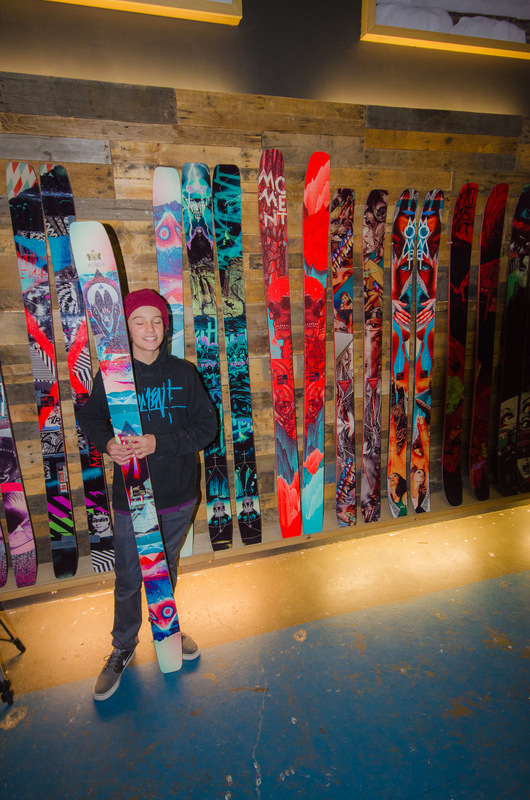 Over the course of just 10 years, they’ve made thousands of pairs of skis and are shipping them all over the globe! 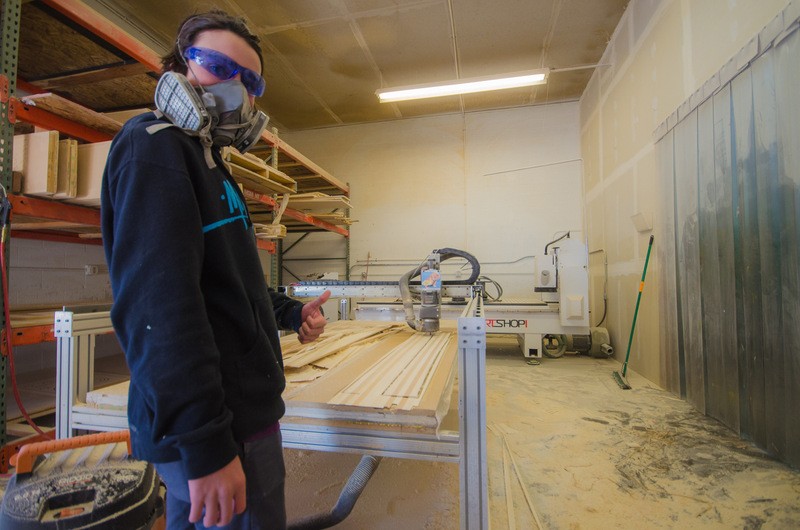 As an intern, it’s really cool to be a part of the whole process — I get to do everything from putting together the ski boxes to making the skis to cleaning the toilets. When I’m a part of the whole process like this, I feel like I’m really contributing to the business, the community, and the whole industry. It’s not part of a curriculum, that’s for sure, but it’s a great way to learn. When people ask me what I really learn from hackschooling, I wish I could throw out this big, long, marathon paragraph of detail, but there’s never enough time. 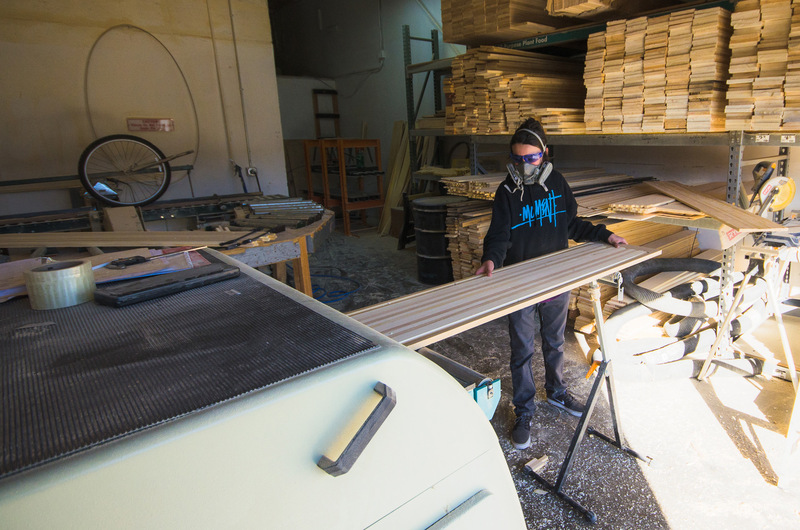 So here is some of what I learn: the long but very cool process of making skis. It starts off with different types of wood. I laminate them together then send them through a filer and a CNC saw for shaping. From there we attach sidewall and different types of fiberglass and carbon fiber. While we’re doing that we’re also printing out graphics for the ski. We end up putting the graphic on different base materials, textured materials. It all depends on what the ski is for. On touring skis, the texture keeps the snow from sticking to the skis while moving, which makes the skis lighter. The skis end up in the lineup room, where we laminate everything together with a BOC epoxy. We then put the skis in a press and let them cook for about 40 minutes. After that we cut them out and send them through a series of stone grinders and do different hard stone structured finishes to a ceramic edge bevel. After all of this we package it up in the boxes I built and send it to your doorstep! My internships get me excited because I like to learn hands-on and I like new stuff: new people, new ideas, new situations, new everything. Internships are 100% real life, and in real life there’s lots of new — some good new and some, well, messy. That’s life. At one point of the day there’s usually a new graphic or piece of clothing that arrives, and I’m always so excited to see new orders. Sometimes, samples arrive all wrong, though. And we have to start over. Say we order a new sweatshirt and the color of the graphic on the sweatshirts is way off, then we know we have to be more specific when we send it back. What I love about Moment and my other internship at bigtruck brand is that most days don’t turn out like we want them to. My internships are messy. Textbooks aren’t messy. They kind of clean up the messy and interesting parts of life and put them into neat paragraphs where everything is in perfect order. My internships are full of unpredictable situations and interesting, imperfect people. Speaking of bigtruck, now I’m going to take you from Reno up to Truckee, Calif., to bigtruck brand. Bigtruck is a small but quickly growing company that makes and customizes hats. We have thousands of different patches and threads with several hats/beanies to choose from. Just like at Moment, at bigtruck I have to go through the hard and boring stuff like vacuuming, cleaning, trimming threads off hats, etc. But when I hear the UPS or FedEx truck pull up, I throw down whatever is in my hands, run to the door, grab the box from the delivery man, and open the box to see what’s inside. I leave all the paperwork for bigtruck’s CEO Galen Gifford, my boss/best friend. (Yes, I did say my 33-year-old boss is my best friend.) Galen is a super smart but very funny guy. In my mind he’s just a full-grown 14-year-old with a daughter and wife. Galen teaches me a ton and takes me everywhere with him, whether we’re going to get lunch for the office, or to the bank, or to go to a ski shop and sell hats. At bigtruck they don’t really treat me like an intern. I feel like I’m a part of the team, like I really contribute. I get to design hats that the actual public buys. I get to go to shops and sell beanies and hats. One of my main jobs is running the “Hat Bar,” where you customize your own hats. I learn business skills. If you check my Instagram feed, it’s full of photos from Moment and bigtruck. I’m learning how to market. The cool thing is that bigtruck trusts me. It feels good to be able to be a kid AND a contributor to a business, our community, and even a whole industry. Some of the best designers are still just scratching the surface of design, excited to get out into the world of design and do what they love. I feel lucky to be spending a few days a week actually designing, not studying it in school at a desk from a textbook, but instead doing it with real entrepreneurs in real businesses. Like I said earlier, I learn so much every time I intern. Sadly, some kids don’t get involved in internships until they’re in their late teens, but the saddest thing is that most kids don’t have the motivation or the opportunities to get involved with internships at all. I want there to be a program to help kids get involved in the things they’re interested in and get cool internships. I would want to put that program in every public school.